Home | Fatwa | Family Matters | Is a person who died through cancer a Shaheed? Is a person who died through cancer a Shaheed? 10,924 people read this post. 1. My Aunt passed away 2 days ago from liver cancer, is my Aunt regarded as a shaheed? One scholar as stated she is (see link, no 4). Just wondering does it differ with the type of cancer? 2. 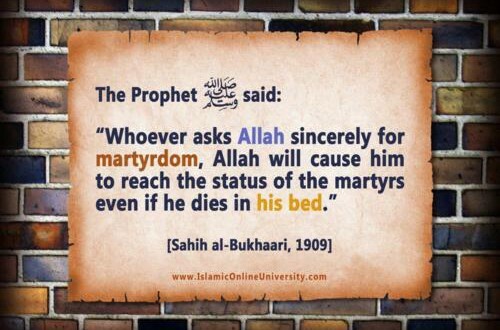 I remember 10 years ago, I read on your website that people who passed away on their beds are regarded as martyrs, a saying of Prophet SAW. Hence, will my Aunt be regarded as this because she passed away on her bed. 3. Can you please kindly list 10 or more ibadats (Esaale-thawaab) my family can do, so that my Aunt can benefit from (please list in importance order) ? Can simple worships like Imam Nawawi’s askhar, Dhikr and salawat be done? A person who passes away due to a cancer of any part of the body will, insha’Allah, be considered a Shahῑd. ‘Dhātul-Janb’ is a growth or inflammation of the membrane that surrounds the lungs – it is referred to as pleurisy. Considering that inflammation plays a causative role in the development of cancer, we may say that cancer falls within the ambit of ‘Dhātul-Janb’. Indeed, if your aunt had asked Allah for martyrdom with honesty, she will have received the status of martyrdom even if she passed away on her bed. Also, you may perform any other acts of worship and make an intention for the reward of the action to be passed to your aunt.